Before jumping into the inaugural sales of Great Basin quarters, a quick mention is in order about U.S. Mint reports on numismatic product sales. In the past, the U.S. Mint delivered weekly sales reports directly to news organizations. That has changed. Earlier this week, the Mint rolled out a new reporting area on its website that includes. Now, let’s get back to the 2013 Great Basin National Park quarters and their debut appearance on U.S. Mint sales charts. This third quarter for the year and the 18th in the series of America the Beautiful Quarters® depicts a reverse emblematic of Great Basin National Park in Nevada. Six products featuring Great Basin quarters launched on June 10, 2013. They include bags and rolls of circulating-quality coins minted from Denver, Philadelphia and San Francisco with respective mint marks of ‘D’, ‘P’ and ‘S’. Two-roll sets of P&D quarters led unit sales among the six products at 9,894. Three-roll sets with P, D and S quarters were next at 4,607. Quarter products from the San Francisco Mint followed with single rolls of 40 coins at 3,146 and 100-coin bags at 2,996. The other two 100-coin bags logged sales of 1,874 for Great Basin quarters from Philadelphia and 1,840 for Great Basin quarters from Denver. Across all six products, a total of 2,150,200 Great Basin quarters were sold. The amount is close to the opening sales of the prior quarters honoring Perry’s Victory and International Peace Memorial in Ohio. Those started at 2,210,700 coins. As expected, Great Basin quarter products were popular. All six of them made it on the Mint’s top-selling list. Also on the list is the 2013 Mint Uncirculated Coin Set, the 2013-W Uncirculated Gold Eagle and the 2013-W Perry’s Victory five ounce silver uncirculated coin. These three products marked their first full week of sales, having debuted the week of June 3. Week-over-week sales of United States Mint bullion coins strengthened for gold coins but weakened for silver coins — a reversal from the previous weekly sales report. 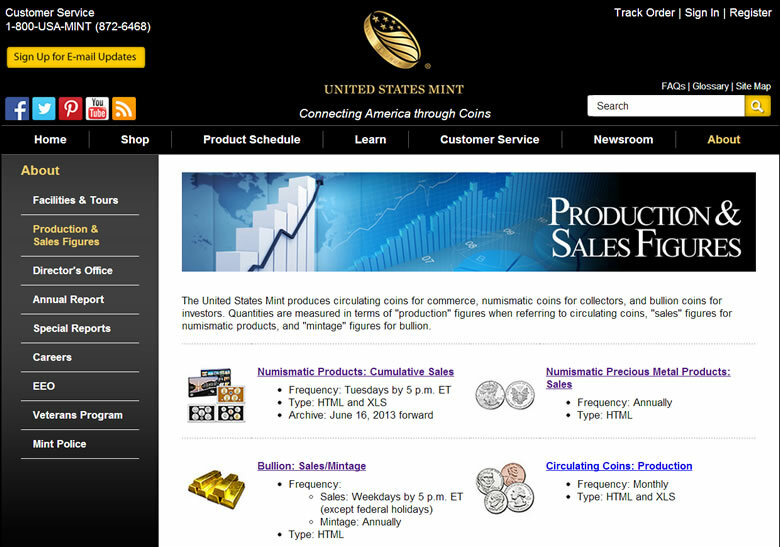 The following grid provides the latest weekly and monthly sales for all U.S. Mint bullion products. The weekly period covers sales from June 13 to June 19, 2013. 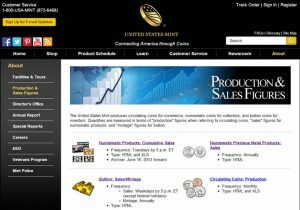 The following tables offer the latest sales for U.S. Mint collector products. The sales period covered is from June 10 to June 16, 2013. 2013 is the 50 year anniversary of President John F. Kennedy assassination. The Kennedy 1/2 dollar went on sale today. They probably won’t last long. Even though the mint is still selling the 2012 Kennedy 1/2 dollars. Personally I’m against celebrating someone’s death so I wouldn’t buy. BTW, this is another mint to customer demand product so they’ll sell until nobody want’s to buy anymore. jim – What if 900,000 people want to buy 1/2 dollar bags & rolls. Will the mint make them? Why not? There are no limits of any kind. There’s no silver in them so they’re cheap to make and have a great profit margin. If there is high demand they’ll just delay delivery until they can satisfy the demand – they’re still selling 2012 halves and it’s June 2013. How much does it cost to make a 1/2 dollar these days? With the Bags and rolls they mint the coins over several days. The Mint may have additional runs to meet demand but no guarantees of a mintage to demand on this one. It seems over the last few years they have continued to sell beyond the current year (i.e. 2012 sold to June 2013) to deplete the excess coins they have in inventory. I am not sure of the current cost of the Clad halves but the cost of copper will be a determining factor. Joe – 17+ cents as of 2006. For some reason unknown to me, the mint stopped reporting annually on the half thereafter. For comparsion purposes, the cent was slightly over a cent and the nickel was 6+ cents and everything else was under face value. Last current numbers I have seen have the penny over 2 cents and the nickel over a dime. All the other coins were under face value. I know Joe. There just seems to be very little bloging on actual coin collecting here. It seems to be mostly wish lists and complaining about the US Mint. RBG – wish lists and complaining about the mint seem appropriate to this forum. All that’s officially posted is US Mint news and some Perth, Canada, and BEP news all of which is new news. So wishes fit and complaints about the US mint fit, too. What else would you have us comment about? How well the articles are(n’t) written? I don’t know Jim… How about coin collecting.